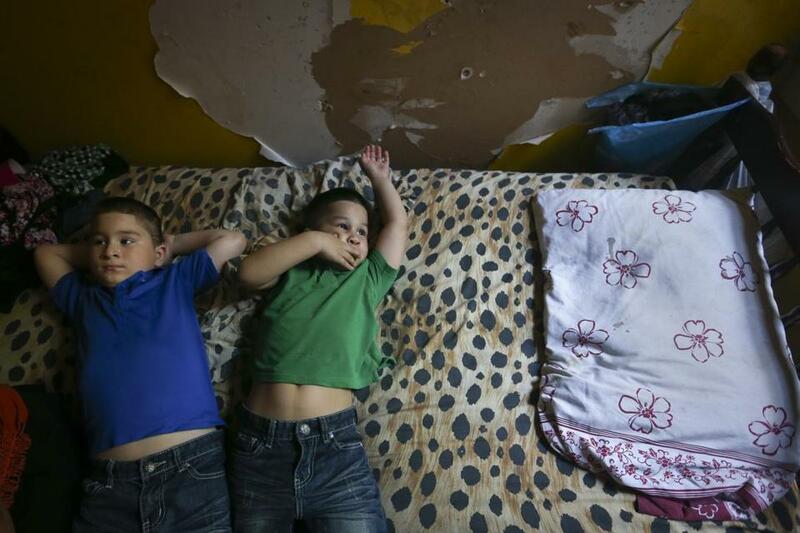 Brothers Jose and William Garcia lay on their bed inside their apartment, where paint peels from the walls. Shortly after Jahnyi O’Neal’s first birthday, a routine blood test revealed an elevated level of lead — nearly double the amount that federal health officials say can harm children. But his doctors weren’t required to notify state authorities or discuss the potential harms with his family, because Massachusetts standards allow a much higher level of lead in the blood before triggering state intervention. Within a year, while his family remained unaware that the boy was in danger, Jahnyi’s blood lead level tripled, finally reaching a threshold that mandated a home inspection and an expensive deleading of the boy’s century-old Dorchester home. “He could have permanent brain damage. We had no idea,” said Lenora O’Neal, his great-grandmother, who owns the seven-bedroom home in the Grove Hall neighborhood. Three years after federal health officials cut by half the amount of lead in a child’s blood that they said warrants medical attention, Massachusetts has yet to tighten its standards. As a result, thousands of children in the state may be at greater risk of lead poisoning, which can cause learning disabilities, behavioral problems, and in the worst cases, even death, public health advocates and lawmakers say. Last year, nearly 5,000 children in Massachusetts tested positive for what the US Centers for Disease Control and Prevention considers to be elevated lead levels, according to the state Department of Public Health. State officials declined to respond to questions about why the state hasn’t changed its rules. Lead paint was banned for residential use in 1978, after years of complaints about young children ingesting the toxic metal in or around older homes. More than two-thirds of homes in Massachusetts were built before then. Only about 15 percent of those homes have been inspected and deleaded, the state says. In recent years, state lawmakers have failed to pass bills that sought to update Massachusetts’ standards. Now, state lawmakers are pushing a new bill that they consider a compromise. The proposed legislation would allow municipalities to set their own rules for when they can order an inspection and require a homeowner to remove lead, while increasing tax credits for property owners to delead their homes and financial penalties for landlords who refuse to rent to families with young children. The bill has the strong backing of public health officials in Boston, where 546 children younger than 4 years old last year were diagnosed with more than 5 micrograms-per-deciliter of lead in their blood. That is the Centers for Disease Control and Prevention’s new standard. The state, by contrast, does not offer families help unless a child is diagnosed with more than 10 micrograms-per-deciliter. It doesn’t require doctors to notify the Department of Public Health or insist on inspections and lead removal unless a child tests higher than 25 micrograms. Dr. Sean Palfrey, medical director of the Boston Lead Poisoning Prevention Program at Boston Medical Center, said he would prefer a statewide policy. But by allowing the state’s largest cities to set their own standards — about 60 percent of all children with elevated blood lead levels live in 18 communities from Fall River to Pittsfield — it would make a serious impact in reducing the number of homes that contain lead, he said. “We’ve been waiting a long time for this kind of opportunity to investigate and remediate the large number of houses that have been poisoning generations of kids,” Palfrey said. Previous efforts in the Legislature to revise the standards, as well as the current bill, have been opposed by interest groups that represent landlords and other property owners. They have raised questions about the scientific basis of the federal guidelines and argue that changing the standards in Massachusetts would saddle their members with major financial burdens. Massachusetts received $420,000 last fiscal year from the federal government to help pay for education, inspections, and other efforts to reduce lead poisoning — less than half of what it received in 2010. Still, the state in the past five years has conducted nearly 40,000 inspections and the attorney general’s office prosecuted scores of landlords. Among the residents affected was Glendy Garcia, a pregnant mother who was evicted from her Chelsea apartment after complaining to her landlord. Her toddlers, Shelsea and Jose, had been diagnosed with lead poisoning from peeling paint. A court eventually dismissed the eviction, but only after the landlord threatened to call immigration officials on the undocumented immigrant from Guatemala. Now in a new apartment in Chelsea, where more paint is peeling off the old walls, Garcia said she has no idea whether there is lead in the cramped walkup. But she has no desire to get in another fight with her landlord. 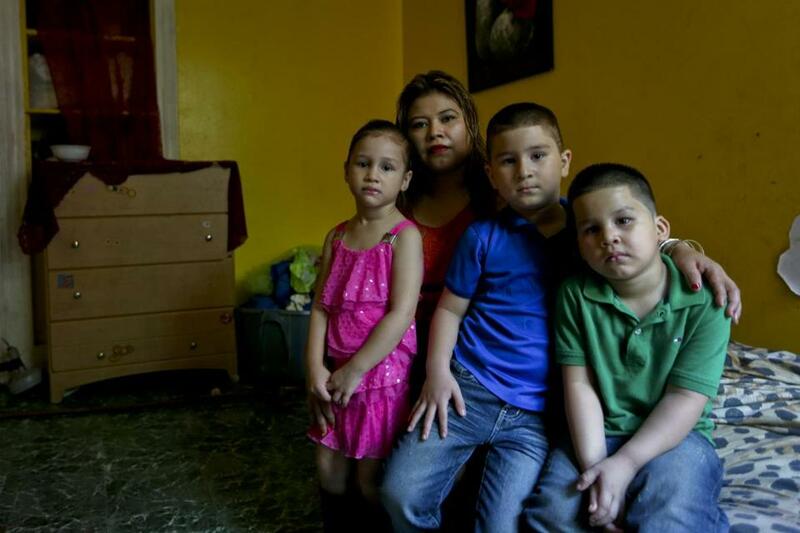 Glendy Garcia posed in her home with her children Shelsea, Jose, and William. Shelsea and Jose had been diagnosed with lead poisoning.